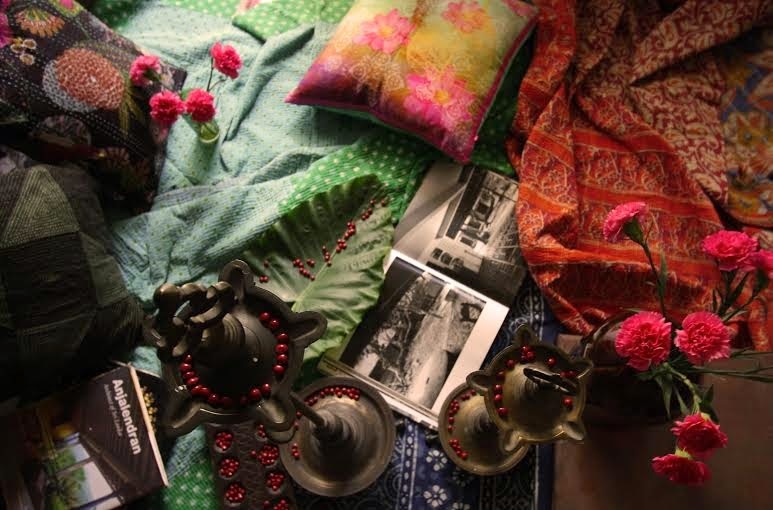 At Aalayam, we house our creative revelations in the vibrant world of multicultural design, art and culinary diversity. Here, we celebrate the visual and cerebral appeal of world culture. We hope our salvo through this blog enriches your lives as much as it does ours. It seems like yesterday that I was brainstorming with Supriya about the mission, content and look and feel for a lifestyle blog that I had wanted to bring to life. With her contagious enthusiasm, Supriya jumped on board right away and I think we found our groove fairly quickly as co-founders. We agreed on the above mission statement as it rightfully captured what we wanted this blog to do for us and for our readers. Today, we are a 100 posts old! It has a been a journey of grit and passion! I think we both agree that Aalayam fuels our creative energy and allows us to focus on our many interests outside of work and family. But Aalayam is more than us detailing our personal creative explorations, it is also a richly layered blog for the bon vivant and in these 100 posts we’ve covered everything under the sun (no,really!) including gorgeous interiors, ethnic Indian inspirations, talented artists, our personal travel journals, culinary adventures and many other topics. Thank you for joining us in our little space on the WWW. Thank you for joining us on Aalayam. Thank you from the bottom of our hearts. The Sanskrit word Aalayam signifies “a place of residence”, a confluence of ideas and inspiration. Today, I bring you Aalayam in collaboration with a few of my favorite (absolute!) bloggers . These forceful images of “Home or Aalayam” will knock your socks off! I admire these bloggers. Their work incorporates ethnic Indian roots and global elements seamlessly. They believe in handcrafted and vintage while keeping a discerning eye on design trends. They think outside the box and believe in creating beautiful spaces that are true to who they are! They teach us to appreciate imperfections and to fall in love with our homes. And through their blogs they create, they inspire and they delight their readers! Presenting to you, the fabulous homes of my fellow bloggers. 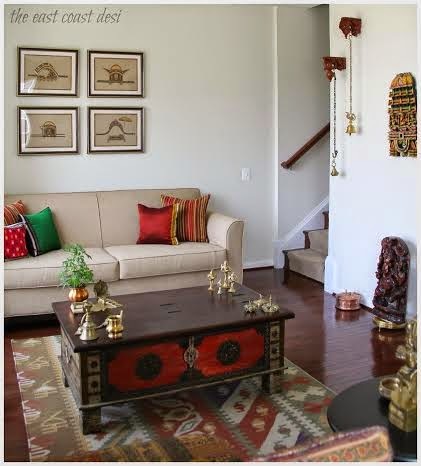 Take a bow ladies- your homes are truly gorgeous and they capture the essence of the word Aalayam. "Congratulations to the Aalayam Duo on their 100th and I’m excited to be invited back to be a part of a significant milestone that this creative team has achieved. 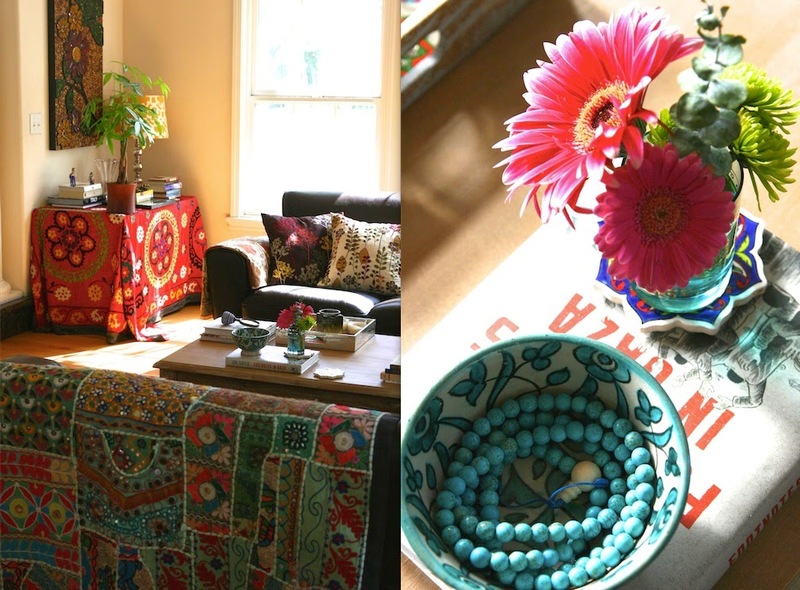 The theme of today’s post Aalayam = home is very close to my heart. Home to me is any place that I can SHARE with the people who mean the world to me i.e. my FAMILY. However,I strongly believe that the ultimate objective of the home making PROCESS is to nurture the mind, body and soul of the individuals who live there. As challenging and delightful as this process may be, it is limited only by two elements, our time and imagination. With no limitations on these two elements, my home is an ever evolving space that is not only reflective of the individual personalities and interests of my family but on a broader level, is a thumbprint of who we are, where we are from and provides us the creative landscape to tell our story of how we got here. Over the years, the process of diligently collecting, conscientiously curating and lovingly layering our home has resulted in a place that is a personal repository studded with inherited treasures, quirky finds uncovered while scouting the flea markets, objet d’ art found on our travels, and relics that talk about our life’s journey together as a family. I can’t but fall in love with this space over and over again as it provides the secure environment for my family and me to reconnect with each other, recharges our batteries for the next day and helps us realign and stay focused on our priorities that may be overlooked in the demanding hustle bustle of the daily grind. And finally, signing off and wishing Deepa and Supriya loads of luck and looking forward to many more inspirational and creative posts in the future"
Hello!! I am Nayana from blog Cherish Dream Live and it gives me great pleasure to be on this amazing blog authored by two gorgeous and creative ladies. Congratulations Deepa and Supriya on your100th post and cheers to all the soulful, colorful and vibrant posts you regularly feature in Aalayam. For me, my home is a Sanctuary. A place where my family blossoms and creates warm memories. At home, I love to surround myself with things we love and hold meaning. Of course, we are a real family and our house always doesn't look like it is out of a magazine. So, it is about finding beauty in imperfections. "Hello everyone! I am from India and am currently living in Seoul. I love to articulate my thoughts about all things beautiful through my blog, ‘A Treat for the Senses’ which is where my love for writing, photography, art and decor comes to life ! My husband and I started with a blank slate in South Korea in an unfurnished apartment that had unadorned walls and quiet corners when I walked into it for the first time. The last six months have been a beautiful experience as we undertook this journey to turn what was just a ‘house' into ‘our home’. I have befriended this brick and mortar structure as I took up the joyous task of doing it up, texturing and layering it with plants, books, cushions, ceramics, art and everything else that is pleasing to my senses. My flea market finds, family heirlooms, gifts from dear friends and personal art breathes life and vibrancy into its various nooks and corners. 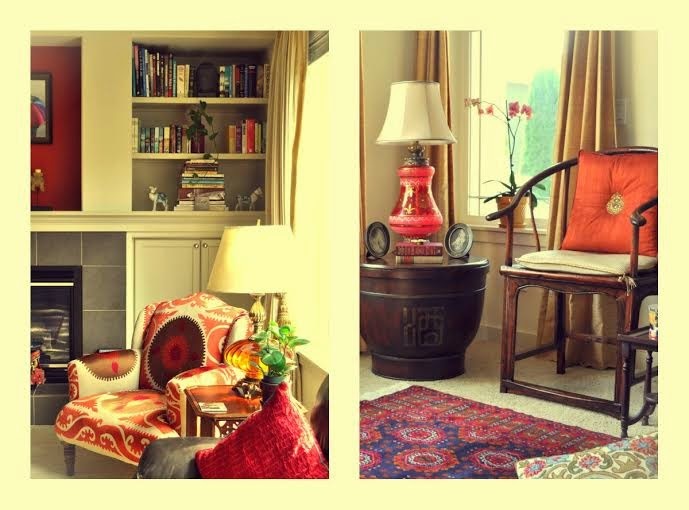 Our home is also an extension of our personalities, and I love the visual symphony that it has emerged to be over the last few months; a union of the aesthetic sensibilities of two different individuals with their own likes and preferences. I always compare our home and the process of doing it up to the creative high of working on a painting for it is not very different to blending different strokes and colors on a blank canvas to arrive at a beautiful piece of art that is your own creation, one that you cherish and love. Our ‘casa’ truly is my drawing board, a place that I love to start and end my day with." "I'm an Interior Design and Architectural consultant by profession and I run my own design firm, SPDA. When I'm not designing homes, I blog! My blog’s called All Things Nice, because, well it’s basically about everything I think is cool and interesting! Although the blog is about design and home decor, I also blog about a whole bunch of stuff- things as random as my love of afternoon tea, to where I love to eat. Home to me is a retreat. It’s a place you can escape to at the end of the day and a place you can be yourself. More than current trends, it should reflect who you are, where you’ve come from and where you hope to be. 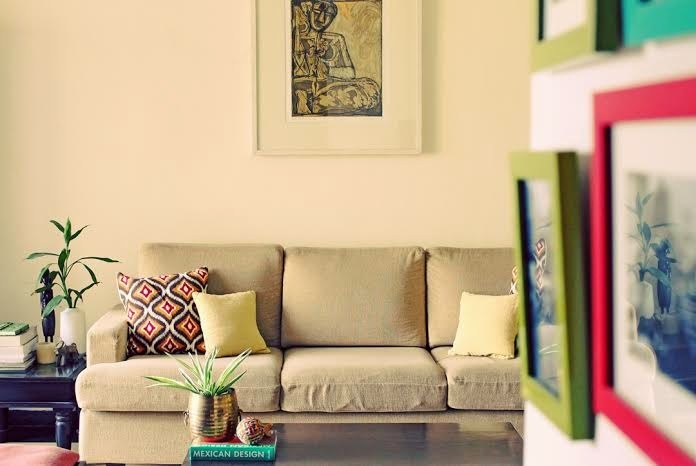 So for me, my home is an amalgamation of the ethnic, the modern and the quirky, but most importantly it’s a place both my husband and I can just be comfortable and be ourselves." I put my heart and soul into designing my spaces. My home is a labor of love because it gives me the opportunity to weave my own unique story. 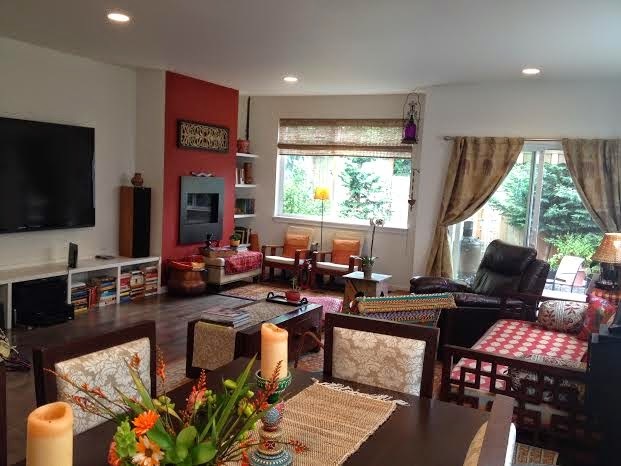 My home tells the story of my family, our roots, our adventures, and shared experiences. It’s filled with the people I love. My favorite books line some of my shelves. There are souvenirs from our travels, along with my favorite photographs. I have pieces from weekend visits to flea markets and antique store finds that I could not resist. My home is also filled with our hopes and dreams. It records our victories and the obstacles we have overcome. I hope that it is a story that my children will carry with them. I want them to reflect back on their childhood home as a place of comfort and immense joy :) So the design is simply a means to an end. I don’t really focus on the mechanics of the design, because I want my home to evoke a warm fuzzy feeling at the end of a long day! 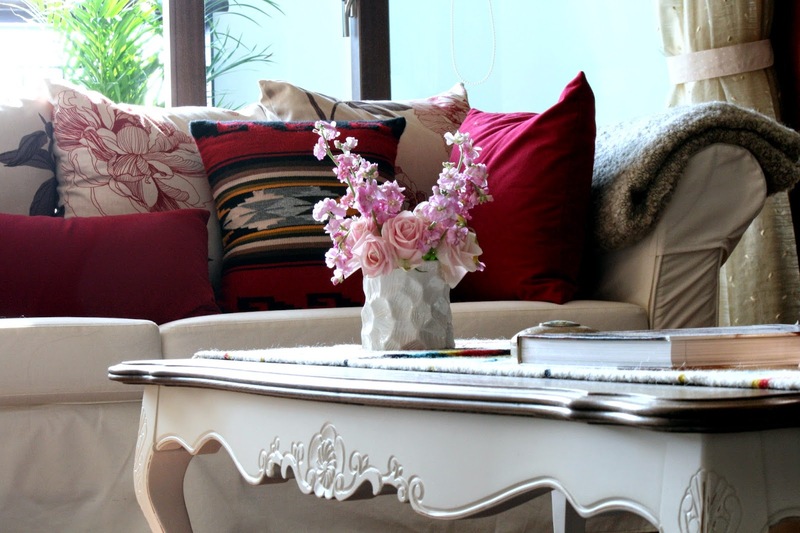 Ultimately, the home is much more than just a menagerie of exquisite décor items. My favorite pieces go back many decades. They are heirlooms that were bought by my Grandparents. These then passed down to my parents. Now, they grace my home. These pieces give a sense of timelessness to my home. These precious things have an eternal beauty. They follow no trends, but they will never go out of style. They fit perfectly in my home. I wish you all luck in evolving your homes as your journeys continue"
"My home is a place that houses both the people and the things I love. It is not, and never will be stationary -- it is palpable, mobile, and temporal, bathed in ever-changing light, and a gorgeous culmination of my energies - of loving, dreaming, caring and sharing. To those who come to my home, I would hope that it gives them an insight into the kind of person I am, or strive to be. Old family photographs on the wall would give them a clue that my ancestry, my heritage and my family, above all else, is the most important thing to me. Decor pieces that have long been in my family, chipped and scratched over time but lovingly displayed would tell them that for me the value of anything lies in its history and its soul, not its price tag at a store. Souvenirs collected during travel would tell them I am a gypsy at heart. The bold colors would hopefully hint at my Indian heritage. My dogs with their torn blankets and pillows would tell them in no uncertain terms that I am an animal lover and my dogs are my kids." Most of all my home is my oasis - a place for me to indulge my creativity, a place that nurtures my senses and my soul." "Home, to me, means so many things. It's wherever my family is. It's a place of refuge and a place to recharge. Over that last year, we have moved homes and it has led me to examine what my relationship to my home is. One thing that has become clear is that I can recreate it wherever we are, so it's not tied to a specific size, building or location. All I need are my collection of vintage fabrics, our boxes of books and my art. It's not about perfection nor is it about matchy-matchy decor. I guess what I am trying to say is that rather than having a decor mantra, home to me is about living surrounded by the people and things I love." To describe a little more - I would say it is a complete reflection of a whole bunch of childhood memories and nostalgia.The colours and culture that we have been brought up in,a little spirituality and a style of our living and everything that we love. Childhood memories as little as the lucky little red seeds called "Manjadikuru"collected, nostalgic memories of the green big leaves and incessant rains and the colors and the culture of the South of India. 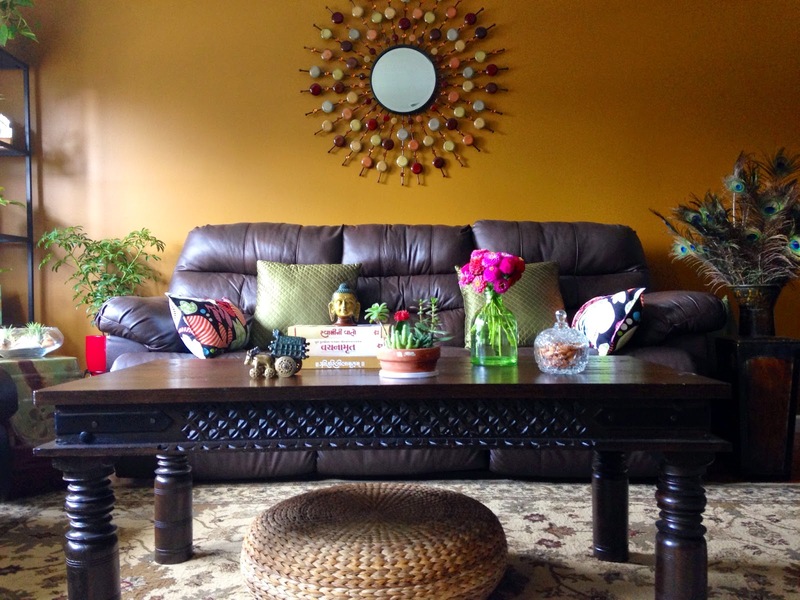 The elements of nature, refreshing colors and warm textures -that's what fills my space at home. Having always valued the simplicity of the old world home interiors, popular for their warm and friendly ambience, my home mainly focuses on texture, grace and charm. One can find various elements from the past in my decor.We love the simple elegance that exudes traditional style "
There you have it! 8 prolific bloggers and home decor divas who have managed to create beautiful homes with a timeless appeal. Pay attention to their words, dear readers, for it will inspire you to believe in the home making process and fill your own Aalayam with charm and soul. I thank all these passionate and articulate women for coming together to help me bring such an artistic post to life. Supriya and I continue to be energized by our vision and stand poised to execute. Here's to Aalayam's next chapter! P.S: all images belong to the bloggers/homeowners. Do not use without permission! Thank you Deepa and Supriya for inviting me to be a part of Aalayam.I am so happy i could share the happiness of 100th post with you!wishing you all the very best! Thank you Deepa and Supriya for this wonderful opportunity. You guys are doing a great job. Its been an absolute pleasure to connect with you both. Dee! Its with moist eyes, I toast you! Happy 100th at Aalayam partner. Here's to the next chapter. Bigger, Better and Bolder! Congratulations to the two of you, Deepa and Supriya and thank you for inviting me to be a part of this wonderful milestone! Good luck and happy blogging! 100 posts! Congrats you two. To sustain a blog thats beautifully written, creative, relevant and current through 100 posts is indeed an achievement. Thanks so much for making me part of this celebration. Keep rocking! Congrats, Deepa and Supriya !!! I've always had a wonderful time collaborating you two lovely ladies and wish you all the very best ! Beautifully composed, congratulations Deepa and Supriya. Feels lovely to be part of this milestone and in such august company ! Wishing you the very best and looking forward to your lovely compilations in times ahead ! Congratulations Deepa & Supriya... thank you for including me in this post... such a generous gesture and I feel really honored to be a part of such an amazing group of women... wish you loads of success and look forward to many more amazing and inspiring posts! aww! now I feel bad that I did not plan for a sequel. But I promise you a lot more fun this next chapter. How about that? Thank you for your kind words themomofangels. Oh thank you Purnima. It means much coming from you. We appreciate your patronage.. Would love to hear what you and other readers want to see on this blog? And the rest of you ladies - thank you once again! Keep doing the good work - thank you for all the beauty you bring into this world. What a vibrant post and a bunch of creative bloggers! Inspired! zest and leisure: thank you for saying it. Sounds like we accomplished our goal with this post. If you are new to the Aalayam family, I want to extend a warm welcome to you. Thank you sangitha! I am catching up on some of your comments now.Thank you for reading Aalayam and being a part of our journey! Thank you very much Kunjan! If you are have started following Aalayam recently, I extend a hearty welcome to you. Please spread the word about our blog as it would indeed be a pleasure to share our inspirations with other interested readers. Ah loved this post guys! Great job with this blog and its a rocking hundred posts old already! Keep it coming. Ambika - you have been such a regular reader of Aalayam. Thank you. It has been wonderful having regulars like you be a part of this beautiful journey.